We both chuckle as we climb into the car and head for home. The only fire was the one lit inside her. There were flames of enthusiasm as she began telling me about her up-and-coming parent teacher conference. “Huh?” Now I know she is a good student, but come on. I mean really … who truly gets excited about conferences? Trying to understand, I stare with intent. Eyebrows furrowed. Waiting for her to finish telling me the “why” behind her excitement. Aha! It turns out that in 4th grade, the students build a PowerPoint presentation and deliver their own conference to their parents. All self led! I started giving this whole approach more and a bit deeper thought. Cute, yes. But what I really came to realize is that this teacher is giving her students, and my child, a gift. The gift of self-reflection. They are communicating their strengths. Admitting their weaknesses. Exploring ways towards improvement. Talking about their mistakes. All of this aloud. And to their parents. A beautiful gift, indeed. 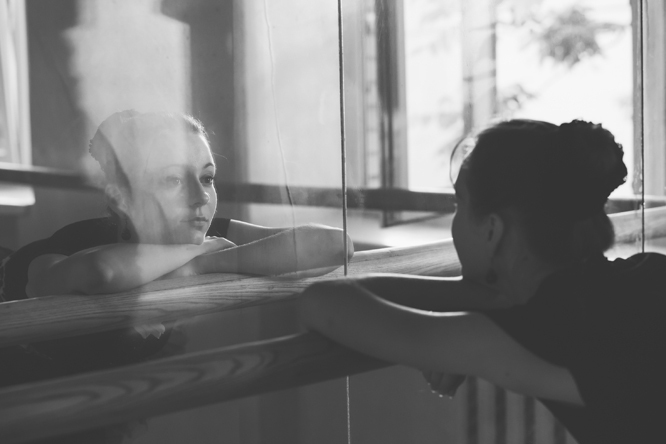 So this little side story is what led me to team with Central Pennsylvania Youth Ballet school principal, Alecia Good-Boresow, and to this blog. With nearly 30 years of dedicated experience in the classroom, I knew Alecia was the exact person to help me help you. Ready for your lesson in self-reflection? What kind of student are you? Have you ever taken a moment to fully realize your strengths? Ever thought about your weaknesses and devised a plan for improvement? From my experience, as both a student and dancer, I have learned that it would be most wise to do so. You spend hours upon hours in the studio practicing your art form, but are they being spent in the most productive way possible? You say and may think you are working hard, but are you truly? Read along as Alecia and I break down the ballet student body. Our hope is that you identify with one of these categories. Possibly share some of its characteristics and find tips and actionable plans to better balance out your daily approach. This type of student easily crumbles and cries. Brought on by a correction or even a studied glance from the teacher. Typically they feel extremely disliked. Not usually the case, but such feelings are prompted by being overly sensitive, insecure and filled with self-doubt. Lastly, a fear of not being perfect, not only in their own eyes as well as others, hinders the effectiveness of the work being put in. Turn It Around! Realize that your self-doubt is actually paralyzing you. I once read a beautiful quote: “When you doubt your power, you give power to your doubt.” Staying present and positive will help enable you to keep negative thoughts from clouding your mind. Learn to self-praise. And for goodness sake, view corrections from your teachers as constructive criticism as they genuinely want success for you, too. Stoic. Stone faced. Call it what you will, but this dancer puts forth little to no expression. These types of students exude a snotty, bored or even an “I don’t care!” attitude. But really they characteristically are deep in focus and usually great dancers. Sadly, these students often get passed over for parts while allowing numerous misconceptions to enter their teacher’s head. Turn It Around! Okay, so your priority is not your face. It is your dancing. I get that, but please remember you have chosen performing art as your path. Your impeccable dancing only matters so much if your face shows no joy or emotion otherwise. No one is asking for a cheesy grin from you. Lift and open your eyes. Your eyebrows. Lift your chin even a touch. A small smile would not hurt. Give it a try. If not, realize you are doing yourself a great disservice. Do not allow your unawareness of what your face looks like or is doing to ever again hold you back. Hard, hard worker. But with such intensity comes much pressure. Sometimes even unrealistic pressure they place on themselves. This dancer receives a lot of attention. They are natural sponges. Good days are phenomenal. But bad days are beyond horrific. Can be moody when things do not go their way. Turn It Around! Keep up the hard work, but it is time to lighten up and live. Your execution of a new step or combination may not be perfect at your first attempt. Do not classify that as a bad day. That is setting yourself up for failure. Maintain realistic expectations. Replace pressure with drive. Vow to do better tomorrow than you did today. All with the same level of hard work and dedication but with a more weightless mind. Oh, and remember that your mind set affects those around you. Behaviors and emotions can permeate and alter the atmosphere in the classroom. This student “enjoys” knocking others down to build themselves up. Overly critical of other’s dancing. They like to point out other’s flaws and shortcomings. All this in an effort to remove the attention from being on themselves. Some would even label this type of student as egotistical. Or even as possessing an inferiority complex. Turn It Around! For starters, drop the act. You are no better than your classmates. Nor beneath. Only different. See in the mirror only yourself. Work on you. Both inside and out. Sure. Look around and learn from others, but let that be it. Realize that when you negatively portray others, you are really defining yourself. All the nonsense is an enormous waste of time and energy. Redirect your newly gained energy into only your dancing. Did you detect any similarities between yourself and Sally, Eve, Becky or Cassie? Maybe you possess a characteristic or two from each one. Well, it is Alecia and my hope that you found this lesson in self-reflection most helpful for the next time you have to face the mirror. Practically Perfect Patty does not exist, but you can certainly work toward what you think she may be like.